Turning up to a game of football without a proper pre-match meal is like lining up on the starting grid of a race without any gas in your car. You don’t stand a chance of consistently achieving your potential if you have not found the pre game meal combination that works for you. Chances are, you already know a fair bit about the key elements you need to look for in your food: carbohydrate, protein, vitamins and minerals. However, it’s carbohydrates that you really need to focus on in your pre-match meal. I’m not going to get too scientific here, but carbohydrate is converted to glycogen, which in turn powers your muscle movement. Now, here’s the good news: your body can store glycogen – both in the muscles and in the liver. The bad news, however, is that it can only store limited amounts and that store is always depleting. Your glycogen stores need regularly topping up because they deplete naturally throughout your day as you expend energy, and even as you sleep! Before exercise you want to make especially sure that your body’s store of glycogen is topped right up, as it’s just like remembering to fill up your car’s tank with petrol (or ‘gasoline’) before you go on a long journey. If you haven’t topped up sufficiently, you’re going to feel weak and unable to hit your top gear, something that most of us have experienced at some point in the past. But don’t go just putting any old fuel in your engine. Just as there are various grades of fuel for a car, some foods are better for your body’s glycogen stores than others. When it comes to pre-match meals, starchy carbohydrates are your friend as they break down into glycogen really effectively. Starchy carbs include potatoes, breads, cereal, pasta, fruits and vegetables. These foods are digested at a rate that provides consistent energy to the body and are emptied from the stomach in two to three hours (though they will stay in your intestine and colon for longer, and that’s fine). 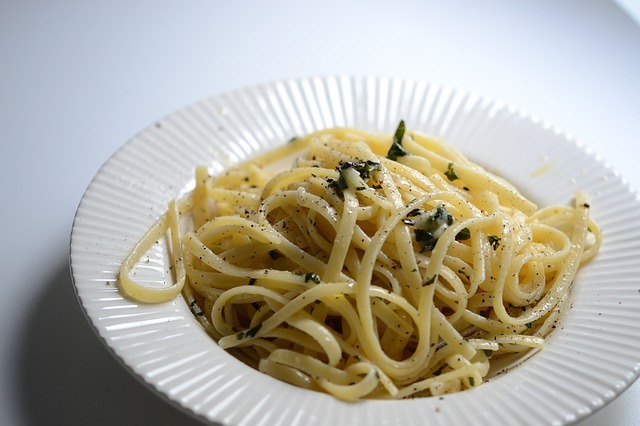 Pasta is one of football’s favorite meals: high in carbohydrates and prepared easily. If you really want to be at your best, then you need to be looking to tuck in to these carbohydrate-rich foods in quantities somewhere between 1-4 g of carbs per kg of body weight before competing, where your game is over 60 minutes. Given that most games of 5-a-side are less than 1 hour (and to avoid over-eating, since that’s just going to make you put on weight), try starting off at 1g/kg of carbs and work up from there if it’s not enough. For most people, 1g/kg is going to be absolutely fine for a 40 minute game of football / futsal. An average sized man, about 70kg, should therefore be looking to eat a pre game meal of around 70g of carbs. If you want to see what a portion of food providing 70g of carbs looks like, see our 11 pre-match meal suggestions for some quick, quality, affordable ideas that you can start using immediately. 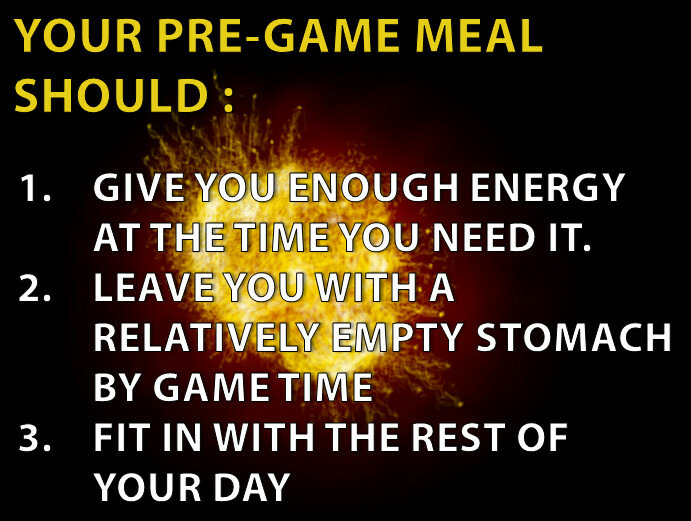 Advice varies on when to begin tucking in to your pre game meal. It really boils down to two things: (i) your personal preference and (ii) what exactly you’re eating (smoothies, for example are quite quickly digested). Despite there being some variation, pretty much all of the experts agree that you should eat in the 1-4 hour period before you play a game. We recommend eating it two to three hours before you’re due to play to ensure it is digested properly. Personally, I like to eat about 2.5 hours before kick-off if I can, that works just fine for me. If you’re in any doubt, it makes sense to eat earlier rather than later. If you find you’ve eaten too early and need more then you can always supplement with a light snack in the 1-2 hours beforehand if you need a little extra boost. On the other hand, if you leave it too late then you could end up feeling bloated and heavy for the game, as well as not giving your body enough time to break the meal down into the energy it needs. A lot of people have an idea that before sport you need to ‘carbo load’, and in their heads this often involves consuming obscene quantities of pasta eaten out of bowls the size of buckets. This is not what it’s about. In fact, your daily carb intake will usually be between 7-12g/kg of body weight so you can see that the 1-4g/kg of body weight in your pre-game meal isn’t some sort of insane attempt at eating incredible amounts of carbs, it’s really just a normal-sided healthy meal of high quality carbs. Just to illustrate how very easy this is, I’ve put together a guide of 11 easy meals that contain approximately 70g of carbs – providing 1g / kg of body weight for the average 70kg man. It’s so much more helpful when you can actually see these meals on a plate. Most of you don’t have time to sit around measuring out exact quantities, that’s why I’ve done it for you. Just click the picture below (which illustrates a few of the options) to go to the article. At some point most of us have got it wrong, sometimes resulting in pretty unpleasant consequences. The good news is that now you understand the simple principles above, it’s very hard to go wrong. Eating too early – you give your body a good top-up of fuel, but do it too early so your reserves have depleted too much by game-time (remember your glycogen reserves naturally deplete throughout the day, even if you’re just sitting at a desk). I’ve done this myself: somehow assuming that a midday lunch will see me through for a 7pm kick-off. It won’t, it’ll just leave you feeling like a shell of a man whist your teammates give you concerned / mocking looks. Not fun. Eating too late – it takes time for the body to digest a meal and turn carbohydrates into glycogen. It happens when you’re in a rush and decide to hoover up whatever you can lay your hands on. Do that too close to the game and you’re not going to feel good: you’ll be carrying around all the weight of the food but you won’t get any of the benefits. Your body hasn’t had time to turn it into energy yet. Eating too much protein or fat – protein foods take longer to digest than starch, so eat moderate protein meals. Fats take even longer still, meaning that you might not feel settled by game time. A fry-up might sound like a great plan before football, but that’s an absolute disaster waiting to happen. You’ll probably have just as much of a chance of digesting your own football boots in time for the game. Eating too much sugar – sugar can give you energy quickly, but it can sometimes cause rapid energy swings in blood sugar levels and result in low blood sugar and, ironically, less energy. You might use some high-sugar foods before a game, but make sure a good portion of your pre-game meal is high-nutrient starchy carbohydrates. What should I drink before football? In preparing your pre-game meal, don’t overlook the importance of keeping yourself hydrated. 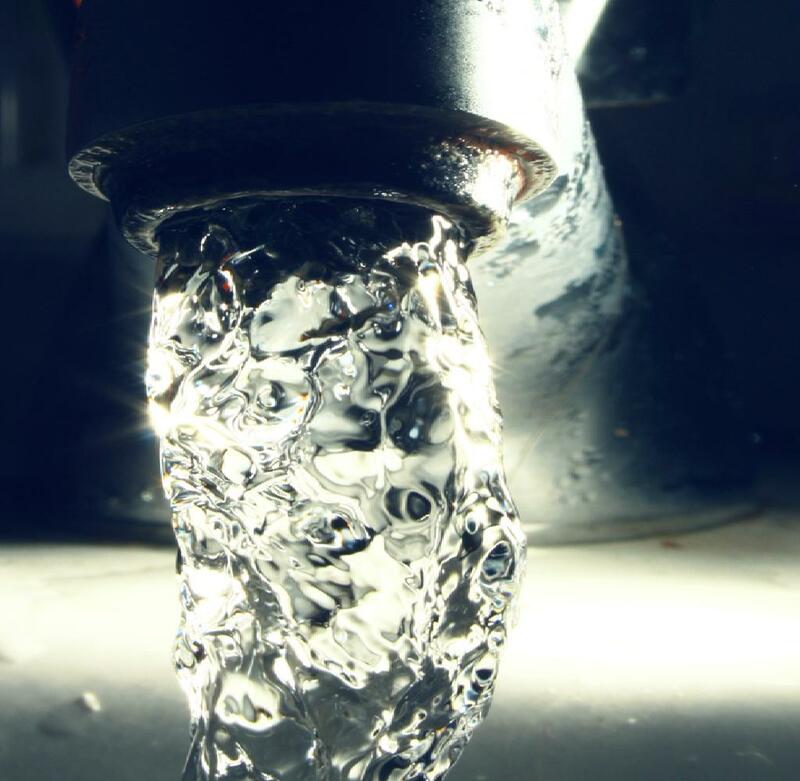 Dehydration of more than 2% of your bodyweight can have a dramatic negative impact on performance, not to mention leaving you gagging for a drink. Hydrating properly isn’t just a case of trying to drink as much as possible before the game. In fact that can be a dangerous thing to do, so please don’t try it. Sports drink manufacturer Powerade suggest slowly consuming of 5-7 ml of fluid (not necessarily a sports drink) per kilogram of body weight starting 4 hours before the game. That’s between 350 and 500ml for a 70kg individual. About 2 hours before exercise they recommend that if you haven’t produced urine, or the urine is dark (a sign of mild dehydration), then more fluid should be consumed (e.g. 3-5 ml/kg of body weight). There’ an endless debate on whether it’s ok just to drink plain water, or if it will benefit you from drinking a sports drink. Don’t worry we’ve got you covered in this article on what to drink for football. We’re all different shapes and sizes and respond differently to what we eat and drink. What works for one person might not work for another. The only real way to find your perfect pre game meal for you is to start off with the guidelines above and then adjust it for your needs. Experiment with different foods and timing of your meal until you get the right combination. Each time you try something new, listen to your body and use it as feedback. Did you feel weak and lethargic or fully fueled and in peak condition? 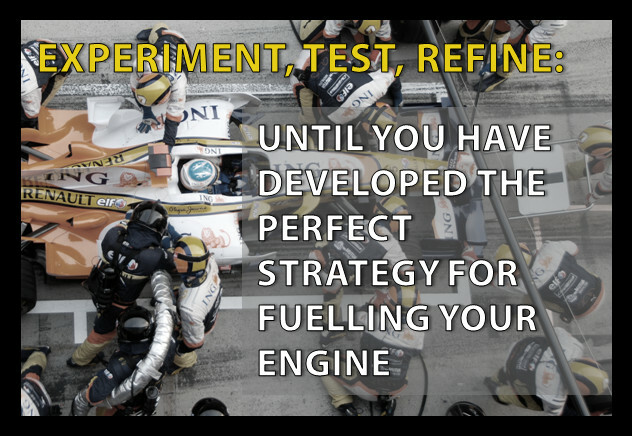 Experiment, test and refine until you find your perfect set-up. By the way, one last little tip: if you think you’re getting your eating right and you’re drinking the right amount of fluids too then make sure you haven’t overlooked getting enough sleep. There really are amazing results from getting enough sleep for sport. Try to settle on a routine but, most of all, find one you enjoy – it will be a lot easier to stick to. 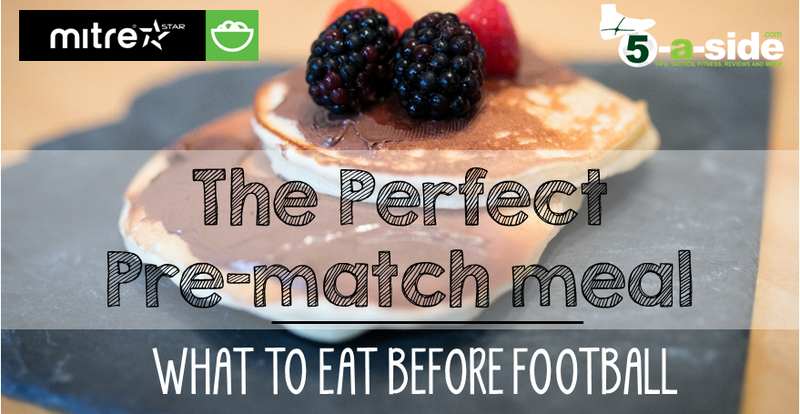 Either time to go back and read about the basics, if you haven’t already in our no-nonsense guide to what you should be eating for football. Or, it’s time to look at those 11 awesome pre-game meal suggestions. Or, skip ahead to read our foolproof strategy for post-game refuelling. If you eat 7g’s of carbs per kg, that would make you obese! 12g’s is just impossible! Excellent guide. I have come to realise that eating right before I play is really crucial. When I feel low on energy and weak for the game it’s usually because I haven’t eaten right. I’ll always eat a little over 2 hours before a game, even if it means I have to eat a sandwich at my desk at work, whilst everyone wonders if I’m just being greedy.